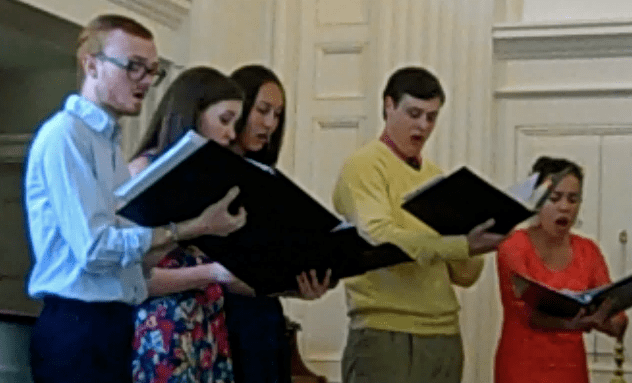 We are an organization seeking to expand the musical experience of the Davidson College community by performing musica antiqua, specifically madrigals. Collegium Musicum had very humble beginnings, starting with only a few practices a month in whatever room we could find. Back then, it wasn’t so much a performing group as it was an interest group. 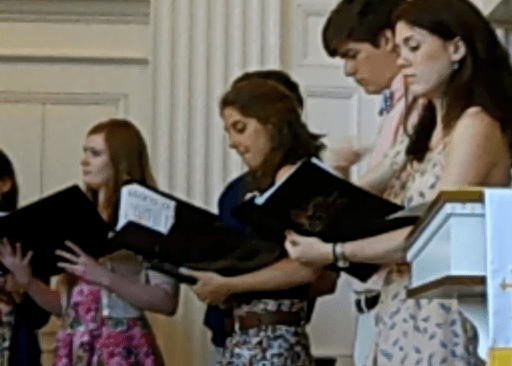 I was asked to join in 2011 during my second semester of my freshman year, mostly because I was an enthusiastic member of the Davidson College Chorale and because they needed another alto. And back then we did not even have an official name. We simply called ourselves “The Madrigals”. A Madrigal is a secular part-song for several voices, emblematic of the Renaissance Era and typically sung without instrumental accompaniment. And that was the music we were most interested in singing, hence our first self-proclaimed name. 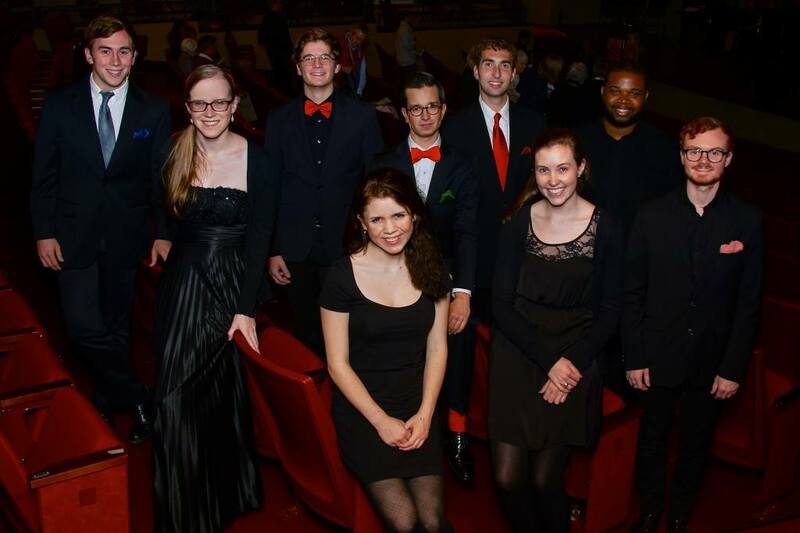 All of us had at one point in our lives been a part of the Davidson College Chorale. But we were interested in having more time in our lives to sing choral music together. And so we gathered together as friends, each with a strong interest in Renaissance music and the ability to confidently sight-read and sing. The group developed over time, eventually achieving Club Chartering and School Funding. Our numbers grew, as did our ability to put on formal performances. After achieving full organization recognition, we made a point to expand our identity as both an interest and a performing group. We hit quite a few rough patches along the way, but overall our growth was steady. It took time to fully differentiate ourselves from a group of friends who liked to sing and an official, selective group of singers. We never held formal auditions. We simply cornered the singers we wanted and asked them to join. Yes, hilariously unprofessional. But at that point we were barely even recognized as a group, let alone well-known enough to attract potential auditions. Raymond Sprague, our original Chorale conductor, helped get the group on its feet. He lent us our first set of music books and encouraged us to start putting on official performances. 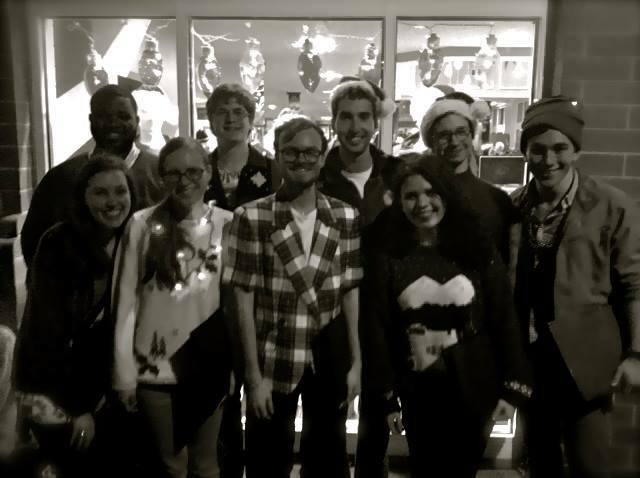 In our second year as a group, we started by singing simple Christmas Carols at “Christmas at Davidson”. This first performance was well received since most singing groups nowadays focus on contemporary or “pop” style Christmas Music. Ironically, our antiquated repertoire was a refreshing addition to the “pop” Christmas trend. We continued to “recruit” (ahem, corner) new Madrigals members and eventually started seriously considering filing a formal charter application in order to receive club recognition and funding. To complete all this, however, we needed a better name. With the help of some intense Italian Google-Translating, we came up with the name “Contanti Cantrapunti”. And yes, as you might assume, it was impossible to pronounce. But nevertheless, with this official name we now earned official recognition! Funny how that one addition technically put our group into existence, as if our previous nameless meetings counted for nothing… But anyways, we were pleased to be formally recognized by the school. We spent the rest of the semester preparing for our final “Springtime Madrigals Concert” and brainstorming future performances. Starting our third year, we had big plans. Our goal was to put on a Madrigals Dinner. And for those not familiar with the concept of a Madrigals Dinner- lightly put, it is a difficult task. 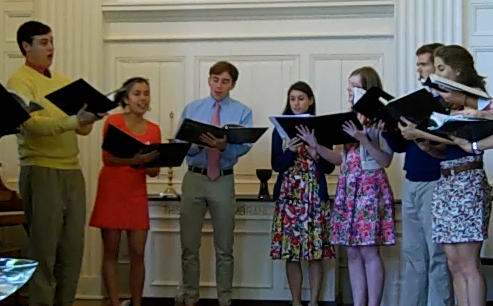 During the event, we would perform madrigals music (hopefully in period attire), serve a Renaissance styled feast, and have historical mini-lectures, readings, and performances while our guests dine. It would truly be a Liberal Arts experience as we hoped to incorporate the Music, English, History, and Theater department. A daunting and exciting goal. Jared Smith, our new adviser, was great help throughout this whole process. He encouraged frequent meetings and documentation of our new goals and progress. He helped us create a smoother and more organized system; he helped turn our casual attitude into a more professional one. He also suggested a new (and much more pronounceable) name: “The Camerata Singers”. We continued to perform for “Christmas at Davidson” and were very happy to also accept an invitation to perform for the Lake Norman Publications. Our new conductor, Chris Gilliam, helped set this opportunity up. This was especially meaningful, because- as a new group- any faculty support is highly encouraging. We continued to work hard throughout the year, but unfortunately were not able to put on our Madrigals Dinner. Alas, our caterer dropped out on us. 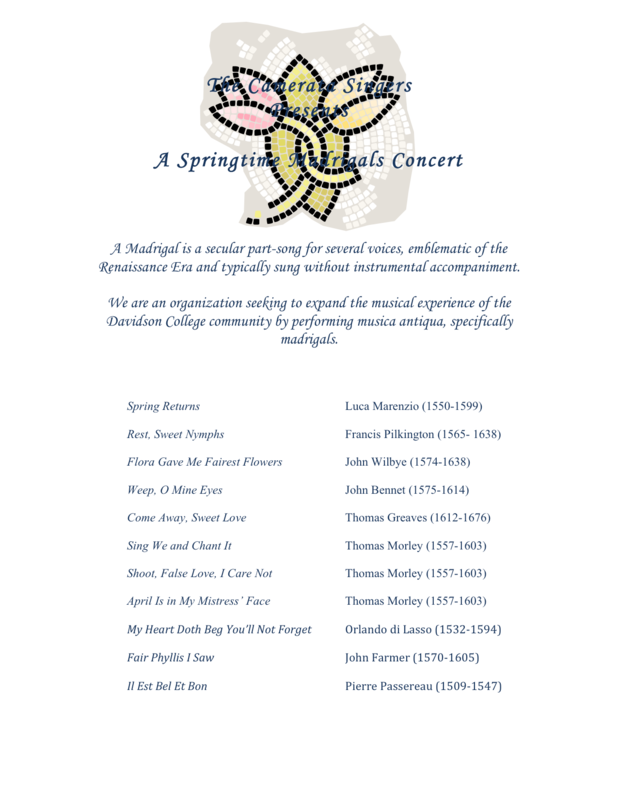 But luckily, we had a wonderful repertoire already prepared and we were still able to put on a highly successful “Springtime Madrigals Concert” at the end of the year. And not only that, but we remained a very tight-knit group of singers. I love that we can boldly take steps towards advancing our group. But we still hold on to our original foundation: a group of friends enthusiastic about gathering and singing choral music together. I was most pleased to hear positive reviews from one of my professors, Dr. Cynthia Lewis. It is always nice to hear congratulations after a show. But it is especially meaningful when the audience member also has a deep familiarity with the Renaissance genre and can therefore truly appreciate the complexities and nuances in the text we performed. It was a lovely way to end the year. We now enter our fourth year, and with high hopes. We still intend to host a Madrigals Dinner by the end of the year, but will double and triple check our caterer’s reliability this time around. Our group is quite a bit smaller now, especially for the women’s section… But we have learned how to better fine-tune our sound and how to be more self-critical of our work. So I believe our quality is just as good. And yet again- we have a name change! According to Dr. Gilliam, our previous name, “The Camerata Singers” technically limited our field of repertoire. He suggested to us our new name, “Collegium Musicum”, as it is more fitting to our style. We seem to have a one-year curse on all group names, so we’ll see if this one sticks… Fingers crossed. Also in exciting news about change- we have formally been accepted into the Music Department, with many thanks to Dr. Gilliam’s support. He is our new adviser this year and has encouraged our group to take a more active leadership role. This transition will help us with funding, facility access, and recognition. I couldn’t be more happy about this change. We held four performances this semester and viewed each as a crucial stepping stone towards our final Madrigals Dinner. And with each performance, or quality got better. We began with a private performance for our families during Family Weekend. We then gave two performances at “Christmas at Davidson”, one at WDAV and one outside The College Bookstore. We ended the year with a fancy and fun performance at Lake Norman Publications. We are currently working on our web profile, inspired by my semester assignment to develop this site. Justin has been working hard on our Facebook Page while I am working on this site and collecting/ editing media. It’s a huge leap, but so far a beneficial one. 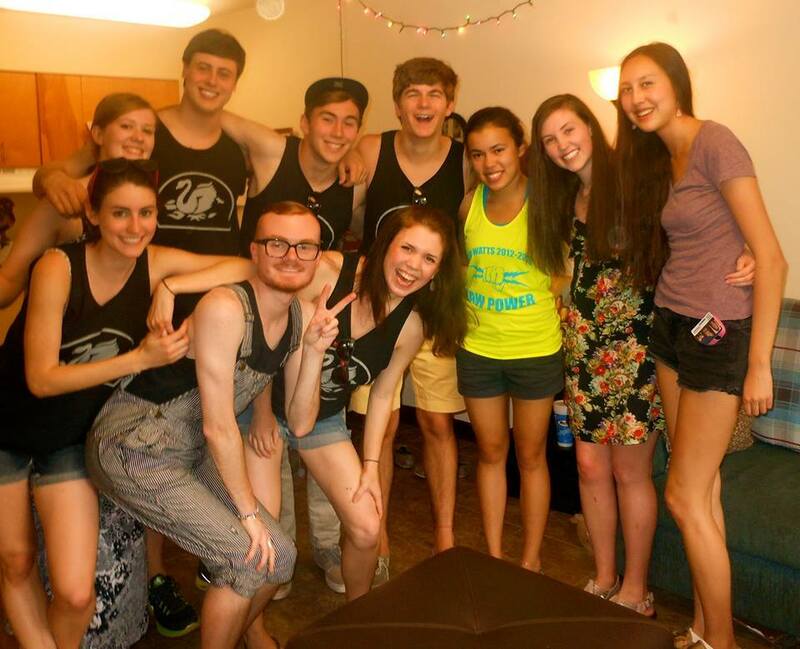 We look forward to having our abroad members back next semester and getting a head start on The Madrigals Dinner! Click here for our full Recordings Gallery. Or click on a song below to go to the individual video.